Snuggy Baby sent us a beautiful Blue Chevron Linen Banded Ring Sling Baby Carrier to review. I was so enthralled with this sling it is simply beautiful! The sling itself is a great turquoise blue linen with silver rings, and on the bands has bright wide stripes in a chevron pattern. The fabric is a bit stiff when we opened it, but it felt great in the hand. The rings had no welds and are complete all the way around. Snuggy Baby Linen and Prestige ring slings measure approximately 28″ x 78″. This is a great size for newborns but still large enough that my wiggly 3 year old can ride comfortably. One feature that I noticed right away that really impressed me was the label inside the sling. It had instructions on how to place the baby inside of it safely. When I first started to use a sling with the almost three-year old I watched a ton of videos and I was pretty good getting her positioned in the house, however the first time I went out all of that information went out the window. 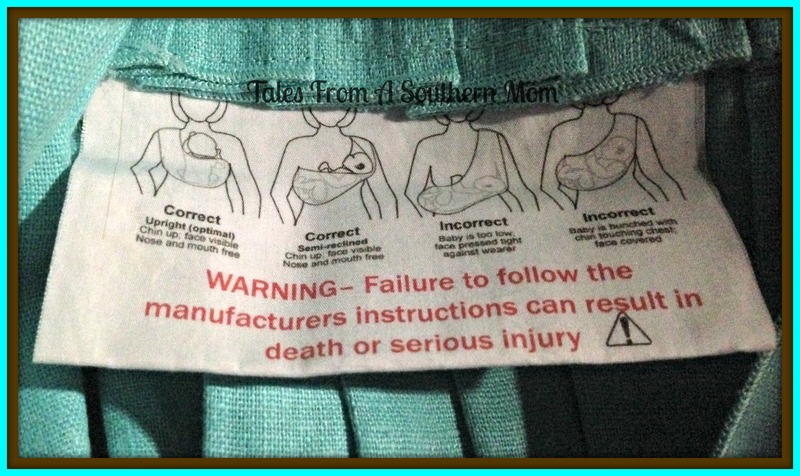 I would have loved if the sling I started with would have had this great label. I love the shoulder on this sling as well, it is pleated and gives a nice cupped shoulder with a comfortable fit. There is almost a feeling of padding there but there is none. It fit snug and up high enough that it did not constantly slip down making the seat of the sling too baggy. When you wear a sling for any amount of time, the shoulder is the key to comfort and this one definitely made it easy to wear for a long period of time. The rails on both sides had a firm seam, but one that moves easily through the rings. It adjusted nicely and held well when it was tightened. The seat with the baby in a froggy position was plenty deep and felt firm and solid. With the baby being so new he is not really straightening his legs or trying to squirm too much. When I put him in the sling and adjusted it, he stayed in place very well. Babywearing can help decrease the need for tummy time. Snuggy Baby carriers allow you to ergonomically carry your baby in the same position that you would normally carry them in your arms. This sling would be great for a new or experienced user, it came with a video to watch, a booklet of instruction in addition to the label that showed how to wear your baby safely. Snuggy Baby carries a lot of different slings and even has doll slings for your little one to carry their own “baby”! The selection is nice, shipping was very quick, and the product is excellent. They carry cloth diapers, wet bags, slings, baby wraps and even cloth diaper safe diaper balm. I would love to have one of everything in the store, so many neat things! For the next month they are offering our readers a 10 percent off coupon that you can use for the whole store, just use code SOUTHERNMOM! I really think that Snuggy Baby has the wrap or ring sling for you. Snuggy Baby has been so wonderful to us and our readers and our also sponsoring a giveaway for a $75.00 Gift Card to their store to one lucky winner. You can use it on anything in the whole store. Enter below and Good Luck! Snuggy Baby #Giveaway | Here We Go Again, Ready? Butterfinger,and I’ve wanted one for days! Sour patch kids and laffy taffy! I LOVE Strawberry and Cherry Licorice! But PLEASE NO Black Licorice! lol My mom thinks she’s funny and tricks me into eat it. BLEH! My favourite candy is Humbugs! I like Twix the best. Anything with dark chocolate sea salt caramels!!! Anything fruit flavored…especially Laffy Taffy! My favorite candy is called Big Cherry, it’s only sold in the southwest. Hmmmmm….does Nutella count? Lol. Probably a Peppermint Patty! I love Jelly Belly Jelly Beans. Or any jelly beans really. But Jelly Bellys are my favorite. For chocolate candy it would be Twix, but I’m also a fan of old-school Smarties! My favorite candy is reese cups! I love Sunkist fruit gems. Anything chocolate and crisped rice. I’m not a big candy person, but I guess the UnJunked / UnReal candy that is like a snickers. mmmm. My favorite candy is Oh Henry bars. I have to pick just one??!! Then my favorite is Baby Ruth bars!! My favorite candy is gummy bears. Hot Tamales. I generally prefer non-chocolate candy. My favorite candy is the candy that is within reach! If I had to choose right now…. Raisenettes!!! My favorite candy is Scandinavian salty liquorice! My favorite candy is starburst! I love Ferrero Rocher Fine Hazelnut Chocolates. Cadbury dairy milk chocolate bars, preferably with nuts but no fruit. My favorite candy is Heath bars.